RIO DE JANEIRO, BRAZIL – Walking the streets and touring the top attractions are good ways to get to know a new city. However, to truly get to the heart of a place, it is important to explore its culinary culture. Rio de Janeiro has a particularly rich gastronomic scene thanks to its smorgasbord of food influences. You don’t really know Rio until you’ve explored its many flavours, photo courtesy of RDJ4U. The combination of Portuguese, African, Indigenous and immigrant culinary traditions, including Italian, German, Arabic, and Japanese, means that there is an intriguing diversity of flavors in the Marvellous City. Food is such an important part of Carioca culture that this year saw the first gastro bloco, Põe Na Quentinha, spring up during Carnival because samba is not the only thing that should be consumed during Carnival. Not to mention the rise of culinary tourism in unusual places like favelas, particularly after Sérgio Bloch published his gastronomic guide to Rio’s favelas. A key part of Rio’s food culture, particularly in the favelas, is the traditional Feijoada. This hearty stew of beans, meat, and pork is typically eaten on a Saturday as a family meal. Travelers can take part in this ritual easily, as most restaurants will be serving Feijoada on Saturdays. This is one of the many ways that foreigners can get to the heart of Rio through their stomachs. Another increasingly popular way to experience the delights of Rio cuisine is through an organized gastronomy tour. 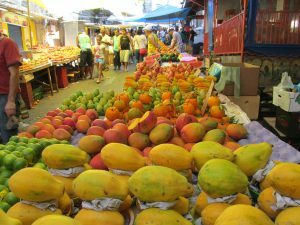 Sample exotic food delicacies on a Rio Fruit Market Tour, take a Chocolate Q Aquim Tour to try some heavenly Amazonian cocoa, or enjoy the local seafood with a Moqueca in Copacabana Tour. These tours together strike a balance between visiting trendy, historical, and off-the-beaten-track areas, stopping at markets, street vendors, juice bars and restaurants. 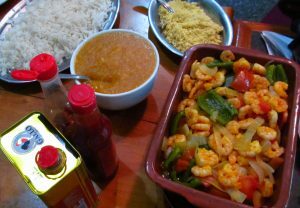 A shirmp stew or moqueca de camarão is one of the irresistible dishes from the Brazilian cuisine, photo courtesy of RDJ4U. They offer an easy introduction to classic Brazilian dishes, taking away the stress of ordering unfamiliar items off a menu. It’s an all-round Carioca adventure, combining food, culture and history. Yet another way to experience authentic cuisine in Rio is to learn to cook it. A Brazilian cooking class gives visitors a chance to make one of Brazil’s signature dishes. It’s an enjoyable way to gain cultural insights and new cooking skills that can be taken home a practical souvenir and a good way to impress friends back home. Plus, there’s that added bonus of getting to eat a good meal at the end of the class. Culinary tourism in Rio de Janeiro is, of course, not limited to formal tours. Some of the most iconic activities in Rio are intrinsically linked to food and the culture surrounding it. One of the best places to experience the informal food traditions is on Rio’s beaches. Vendors offer sunbathers everything from meat and shrimp skewers, to corn on the cob, salgados and açaí . This is complemented by the beach kiosks, particularly iconic on Copacabana and Ipanema. Here, thirsty beachgoers can chase down their beach fare with cold coconut waters, caipirinhas and ice cold beers. Rio’s food culture should also be explored in its more formal eating establishments. With per kilo buffet restaurants, churrascarias, Saturday Feijoadas (or any day of the week at Casa de Feijoada in Ipanema), gourmet restaurants and classic establishments like Garota de Ipanema and Rio Scenarium, there are plenty of starting points to get a taste of Brazilian cuisine. Culinary tourism in Rio de Janeiro is on the up, and for a good reason. It’s a deliciously fun way to get to know the Carioca culture and explore the history of Brazil. * This is a Sponsored article written by Nicole Eberhard, English Content Editor for Rdj4u.com.